A Supreme Court bench comprising Chief Justice of India (CJI) Dipak Misra, Justice A M Khanwilkar and Justice DY Chandrachud decided to hear on February 5 the transfer petition filed by two Adivasi women – Suneeta Pottam and Munni Pottam, who have filed a PIL before the Chhattisgarh High Court (HC) in September 2016 against the alleged extrajudicial executions by the police and security forces against the Tribals. The duo has moved the Supreme Court seeking transfer of their petitions from the High Court in Bilaspur, Chhattisgarh, to the apex court as the similar issue in Nandini Sundar and Ors v State Of Chhattisgarh is pending. Their counsel Prashant Bhushan and Vrinda Grover submitted that the women had moved their petition before the high court which had declined to intervene after observing that the top court was seized of the similar petition. “They were also threatened to be implicated in false Naxal cases,” he said. Opposing the plea, Additional Solicitor General Tushar Mehta said a large number of security personnel have lost their lives. In view of the situation prevailing in parts of Chhhattigarh, it is important that all such cases of gross human rights violations and encounter deaths may kindly be dealt with by this court, which is already seized of the matter in Nandini Sundar case, and has been monitoring the situation therein and ensuring accountability of the state of Chhattisgarh towards protection of people’s fundamental rights. 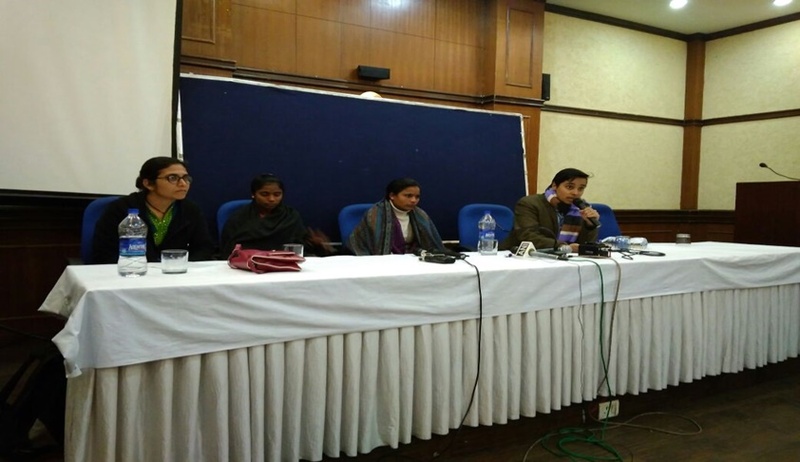 According to the petitioners, instances of extrajudicial executions by police and security forces that have occurred in Chhattisgarh during the course of the counter-insurgency campaign. The security forces have claimed that these cases are of ambush of security forces by Naxalites and the ensuing deaths have resulted due to firing in self defence. In contrast, villagers and family members of the deceased claim that these are deaths of unarmed villagers who have been executed in cold blood by security forces. The Petition was filed last year before the Chhattisgarh High Court in Bilaspur by 19 year old Suneeta Pottam and 18 year old Munni Pottam, backed by a national women's organization, the WSS (wssnet.org). Initially, it had documented extra-judicial execution of 6 people in the villages of Kadenar, Palnar, Korcholi and Andri in Bijapur district. However, as the case wound its way through the High Court, other such instances were also added. Citing such occurrences, the Petition had contended that there was a "complete breakdown of the law and order machinery" in the district of Bijapur, "where innocent, unarmed villagers are being gunned down in extra-judicial killings by security forces with complete impunity, and with, seemingly, no departmental or judicial supervision, in gross violation of the most fundamental of all rights – the Right to Life guaranteed in Article 21 of the Constitution". It had further challenged the current policy of enrolling surrendered militants into the District Reserve Guard, which has been alleged to be "at the forefront in all these documented encounters". It explained, "The current practice, in which the very people who have been terrorizing the villagers earlier as Naxalites are then sent into the same villages, armed by the state with lethal weapons, but this time as representatives of the state - is counterproductive for purposes of establishing lasting peace in a strife-torn area, and contrary to the above principle from the Surrender Policy." Rewarding these surrendered militants for their participation in encounters was also contended to be contrary to the guidelines for dealing with encounter deaths issued by the Supreme Court in the case of PUCL and Anr v. State of Maharashtra and Ors, Criminal Appeal No.1255 of 1999. The Petition had, therefore, sought institution of a Court-monitored, high-powered Special Investigative Team comprising Police Officers not associated with Anti-Naxal Operations, in order to probe such instances of extra judicial executions. It had also demanded that compensation be paid to the family members of the victims. Further, it had sought a direction to the State Police to cease from deploying the accused policemen in active field operations, pending investigation. Faced with a dozen affidavits of the villagers whose family members were killed, the High Court had, thereafter, observed that the questions of extra judicial executions and government policies which are responsible for these are similar in spirit to the issues raised by the Salwa Judum petition (Nandini Sundar and Ors vs. State of Chhattisgarh), currently being heard by the Supreme Court. Following this, the Petitioners had approached the Supreme Court last year, seeking transfer of their PIL to the Apex Court.